It has always been a bit of a surprise in our family that I turned out such a philistine. Coming from an artistic background it was expected that I would be a great musician, painter or something. The fact that the only thing I'm vaguely good at is programming computers was a bit of a let down. Fortunately this seems to only have been a slight hiccup in the genetic progression, and some members of the family have managed to pick up some of the cultural genes. Hence my attendance at the York Student Orchestra this evening. (which was jolly good by the way). 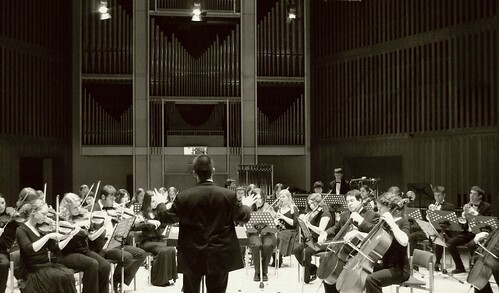 Whatever my limitations, I love the sound of an orchestra going at full steam ahead. They sounded great.